— NASA handed over the "keys" for its only full-size space shuttle trainer to the Seattle Museum of Flight last week, clearing the wooden mockup to leave Houston for its new home in the northwest. 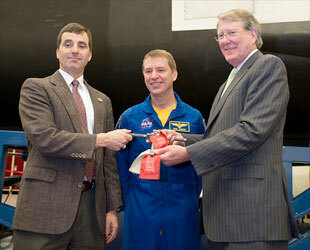 During a ceremony held last Thursday (Jan. 19) inside the Space Vehicle Mockup Facility at NASA's Johnson Space Center, NASA mission operations director Paul Hill signed an agreement and presented Museum of Flight president Doug King with a "Remove Before Flight" pin to symbolize the transfer of the 120 foot (36.6 meter) long Full Fuselage Trainer (FFT). "The Museum of Flight is now going to be displaying the FFT," Hill said. "They can now walkthrough and see, and experience somewhat, what the rest of us have had the opportunity to see. This great trainer that most people who have flown into space — every single person who has flown on the shuttle — has trained on and learned how to be ready to do what they were going to do." 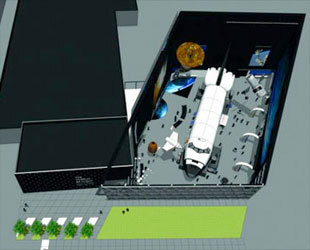 The Museum of Flight plans to display the wingless-space shuttle model in its new 15,500 square foot annex, named the Charles Simonyi Space Gallery, at the center of a new permanent exhibit scheduled to open to the public in June. Titled "Spaceflight Academy," the interactive FFT display will help tell the story of how shuttle astronauts trained for their missions and how the knowledge gained during the first 50 years of spaceflight has helped prepare humans to explore farther into the solar system. 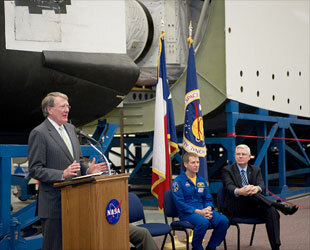 "The FFT is changing its mission," King said, speaking at the NASA ceremony. "You used it to train everybody that has gone to space [on the shuttle] and now we're going to use it to tell the public what was accomplished in the last 30 years and maybe more importantly, what comes next." 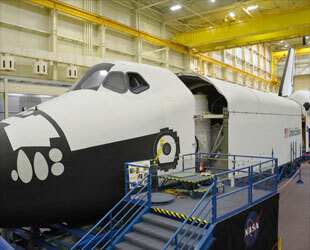 Last November, in preparation for shipping the FFT to the Museum of Flight, NASA workers separated the mockup into three sections — its crew compartment and nose, 60 foot (18.3 meter) payload bay, and aft section and tail. From the latter, the two engine pods and vertical stabilizer have and will be removed for separate shipping. And the deconstruction work won't stop there. The cargo bay still needs to be cut into 30 foot (9.1 meter) sections and have its doors removed before it can be loaded into shipping containers. Each plywood section also needs to be hoisted off its metal stand due to weight constraints. Ultimately all the pieces will be trucked to nearby Ellington Field, which will require temporarily removing and lowering street signs and traffic signals to clear mockup's height. Once at Ellington, the trainer will be loaded onto NASA's Super Guppy, an Airbus cargo aircraft previously used to ship International Space Station components to Kennedy Space Center for their launch into orbit. 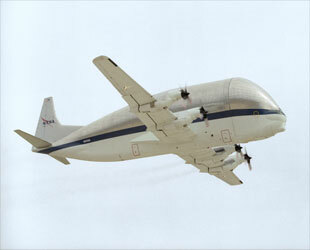 The aircraft has a unique, bulbous hinged nose that can open more than 200 degrees, allowing large pieces of cargo to be loaded and unloaded from the front. "The Full Fuselage Trainer finally gets to fly," King said. It is expected to require five to six Guppy flights to deliver the FFT to Seattle. The flights, which will need to bypass the Rocky Mountains due to altitude limits, are scheduled to begin on May 1 and continue through mid-June. "We've got a lot of work ahead of us. We need to get it out the door and need to get on the Guppy and up to Seattle, and I look forward to doing that," Seattle-born astronaut Greg C. Johnson, who will pilot many of the Super Guppy flights, said. As the Museum of Flight is located at the south end of Boeing Field/King County Airport, Johnson will be able to taxi the Guppy right up to the facility for the FFT sections to be unloaded. Once on the ground, the mockup will be reassembled to be the centerpiece of the Charles Simonyi Space Gallery — and the center point of a celebration. "Seattle's celebrating this summer the 50th anniversary of its World's Fair," King said. "In 1962 there was a World's Fair called 'Century 21' and it was all about what the world would be like in 2012. It seemed so far away. Well, now we are going to be looking at what really happened and what happens next." "Our museum is in charge of all the aerospace activities around the World's Fair celebration and [the FFT] will be the center point — its arrival and its reconstruction," King said. Johnson Space Center employees who worked with the FFT, including astronauts and their trainers, will be invited to Seattle to give talks at the museum and around the city as part of the anniversary celebration. "It is gratifying to know through the efforts of an awful lot of people, this artifact, this Full Fuselage Trainer, is going to inspire the public in the northwest for many many years to come," Michael Coats, Johnson Space Center director and former shuttle astronaut, said. "The Full Fuselage Trainer is the only one of its kind in the world and a simulator that every astronaut has used to train for 135 space shuttle missions. It is vital that we preserve this important piece of history."